Q: What is your relationship like with your brothers and do you have any sibling rivalry going on? A: My brothers and I have good relationship with each other and get along very well at home and at the ice rink. In skating, we have always competed against each other from the very beginning so it isn't a big issue for us. Of course, we still all want to beat each other in competition but I wouldn't really call it a rivalry. Each of us trains at different times based around university and work schedules so we aren't always at the rink together. Although, I prefer training at the same time as my brothers because there aren't many other skaters at the same rink at our age and level so it is good to work and push each other to be better. Plus it is always good to have others around to have a laugh and keep training fun. Q: Last year you placed just off the podium at the Australian National Championships. What are your long term goals in skating and what do you think it will take to make it to the top of the podium? A: Last year's Nationals was disappointing for me. Training had been going extremely well leading into the competition but in practice the day before my event, the sole and heel of my boot split off. I ended up skating with my boots held together with duct tape. I had a bit of trouble with that. My 2 long term goals for my skating are to become Australian Senior Men's Champion and to achieve the Worlds minimum TES scores. I think it would take a lot to make it to the top of the podium at the moment but a lot can happen at Australian Nationals and we are often surprised by some of the results each year. Q: You've had some international experience, competing in events like the Cup Of Nice, Golden Spin Of Zagreb, Crystal Skate and the Volvo Cup in Latvia. What has been the most interesting experience you've had travelling and what is one country you'd most love to compete in? A: The most interesting and fun experiences I have had while travelling is tasting the different foods from around the world. I like putting myself out of my comfort zone and trying different foods that I usually wouldn't get the chance to eat at home. My favourites have been frog's legs and escargot in France. I couldn't bring myself to try the turkey balls served at the hotel in Romania while competing at Crystal Skate. The country I would most like to go and compete in would be Japan. Although I have already competed in Japan at a Junior Grand Prix, I would love to go back and explore the country more. I learned Japanese at school for 6-7 years and haven’t had a chance to use the language in a long time. Q: The Australian National Championships are coming up, what are your goals for this season and what can you share about your new programs for this year? A: I have a few different goals this season. I am happy to say I have already achieved my first goal at the 2013 Cup of Nice just a few weeks ago, which was to gain my Four Continents and Olympic TES scores. Some of my other goals of the season are to skate a new personal best in both programs at Nationals and make the 2014 Australian Four Continents team. For my programs this year I am skating to "Pagliacci" and "Nessun Dorma". A: My favourite movie of all time is a nerdy one but it would have to be The Dark Knight. Q: In what area has your skating most improved over the off season? A: After a string of disappointing performances towards the end of last season I needed time off so I could learn to enjoy skating again. Therefore, I spent 2 months off the ice to rest and recover. Starting again with a fresh mind really helped my motivation and I have worked hard on improving my quality and consistency with jumps in programs. Q: Who are your three favourite skaters of all time and why? Who is your favourite Australian figure skater? A: I look up to and admire a lot of different skaters. I really love to watch Akiko Suzuki for her sophistication and artistry; she is a real joy to watch. I admire Rachael Flatt for the amount she has achieved in skating (Winning Junior Worlds, 5th at Senior Worlds, becoming U.S. National Champion and making the Olympic team) while graduating high school with top grades and being accepted into the college she wanted. She really is a great role model for all young skaters. 2 of my all time favourites would have to be Yuna Kim and Alexei Yagudin as they both have the total package as figure skaters with strong jumps, spins and presentation/artistry. But... my all time favourite has to be Midori Ito for the joy she showed when skating plus the strength, speed and power she had when jumping is no joke. My favourite Australian figure skater is most definitely Cheltzie Lee. I have known Cheltzie for a long time and although we live in different cities she is one of my best and closest friends. I am really proud of everything she achieved during her skating career, placing 20th at the 2010 Vancouver Olympics after only being named to the Australian Olympic team 1 week before the games began. Off the ice she is also a high achiever studying Special Education at university and has recently been inducted to the Honor Society at her University. She is a kind-hearted and determined girl that will achieve anything she puts her mind to. I am truly grateful to call her my friend. Q: In 2007, the fatal crash of the Merinda near the Sydney Harbor Bridge claimed the lives of four members of Australia's figure skating community and injured three others. What kind of an impact did this accident leave on the skating community? A: The accident left a huge impact on the Australian figure skating community as we are such a small group. The Morgan Innes Foundation was established to honor the lives of seven people drawn together by their love of figure skating. While four people died tragically, three remained seriously injured in the collision between a boat and ferry on the Sydney Harbor. 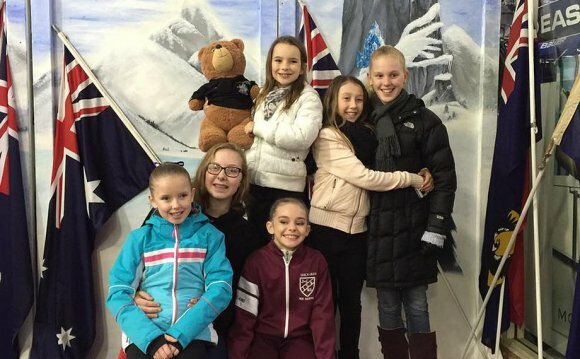 The foundation celebrates the lives of these passionate people by raising funds to help young ice skaters pursue their ice skating dreams and provides opportunities for disadvantaged youth to experience the fun that brings all skaters to the ice each day. I am very fortunate and proud to have been the recipient of the scholarship in 2008 as I was friends with Morgan. Using the scholarship I was able to travel to Colorado Springs, USA to train with Kathy Casey, Christy Krall and other coaching/teaching at the Broadmoor. If it wasn't for the scholarship, I would not most definitely not be where I am today in skating. A: One thing most people don’t know about me is that growing up I was very accident prone. I have broken my front teeth 5 times and also broke both my arms at the same time. Funny enough, none of my accidents have happened while skating but do involve the playing of my clarinet. Q: When you're not on the ice, how would you spend "the perfect day"? A: Any day I get to stay home sleeping in is a perfect day, although I wouldn't mind spending the rest of the day at the beach, watching a movie and having a nice seafood dinner with family and friends.